When Ludwig I, the Crown Prince of Bavaria, was to celebrate his wedding in Munich in 1810, he decided it was an occasion for all of Bavaria to celebrate. 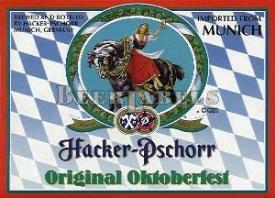 He commissioned Joseph Pschorr, then the brewmaster of the Hacker-Pschorr brewery, among other Munich brewers, to develop special brews to commemorate the occasion. The beer was so good that the party lasted for days and Oktoberfest beer was born. Subsequent annual celebrations evolved into the city of Munich’s world-famous Oktoberfest, which is attended by over 6 million people each year, who in 2003 consumed over 6 million liters of beer. 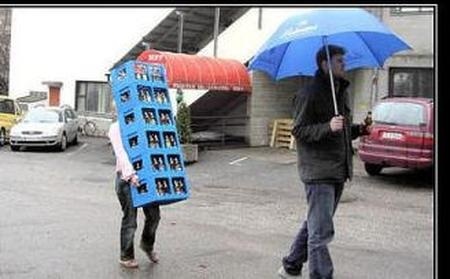 By Munich law, only the six breweries within the city limits of Munich are invited to serve their beer at Oktoberfest. The Hacker-Festzelt (Hacker) Tent has a capcity of 9,300. Samuel Adams® Summer Ale is an American wheat ale. This summer seasonal uses malted wheat, lemon peel and Grains of Paradise, a rare pepper from Africa first used as a brewing spice in the 13th century, to create a crisp taste, spicy flavor and medium body. The ale fermentation imparts a background tropical fruit note reminiscent of mangos and peaches. All of these flavors come together to create a thirst quenching, clean finishing beer perfect for those warm summer days. Sam's brew uses Hallertau Mittelfrueh Noble hops and a Samuel Adams ale yeast. This is a generic Blonde Ale session beer from Austin Homebrew. Easy-drinking, approachable, malt-oriented American craft beer. The following describes the details of a typical blonde ale. Aroma: Light to moderate sweet malty aroma. Low to moderate fruitiness is optional, but acceptable. May have a low to medium hop aroma,. Appearance: Light yellow to deep gold in color. Clear to brilliant. Low to medium white head with fair to good retention. Flavor: Initial soft malty sweetness, but optionally some light character malt flavor (e.g., bread, toast, biscuit, wheat) can also be present. Caramel flavors typically absent. Low to medium esters optional, but are commonly found in many examples. Light to moderate hop flavor (any variety), but shouldn’t be overly aggressive. Low to medium bitterness, but the balance is normally towards the malt. Finishes medium-dry to somewhat sweet. No diacetyl.